TAMPA -- It doesn’t even have a formal name yet, but a Hyde Park UMC outreach ministry, currently known as the Downtown Initiative, has set its sights on engaging workers and residents in downtown Tampa to make and grow disciples of Jesus Christ. 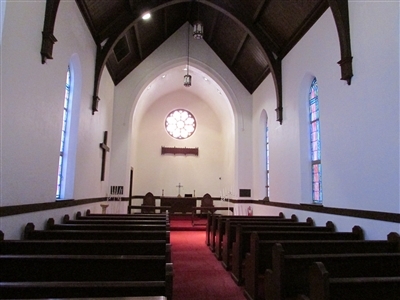 The chapel of the former First UMC, Tampa, holds promise for new ministry opportunities through the Downtown Initiative. Photo by B.C. Manion. The Downtown Initiative ministry of Hyde Park UMC, Tampa, will build on the legacy of God's work begun in the 1800s at First UMC, Tampa. The initiative stems from a visioning process done by the Hyde Park congregation in the early 2000s, said Rev. Justin LaRosa, pastor of the Downtown Initiative. An element coming out of that visioning process was dubbed “Cross the River,” referring to the Hillsborough River that bisects Tampa's central commercial hub and a future need to address an expected explosion of growth east of the waterway. Back when the visioning occurred, First UMC, Tampa, was still operating at 1001 N. Florida Ave., and Hyde Park UMC wanted to be respectful of that congregation, LaRosa said. There was no need to rush. The housing market, now on the rebound, had crashed, leaving newly constructed condo towers in downtown Tampa nearly empty. Now, as the economy begins to improve and more people are moving into downtown, Hyde Park UMC’s vision has found its time. While the initiative is coming out of the Hyde Park church, there’s a desire to recognize the rich history of First UMC, LaRosa said. “We really want to honor that tradition rather than to ignore it. As we repurpose the property, we’re going to be looking at ways to do that,” LaRosa said. 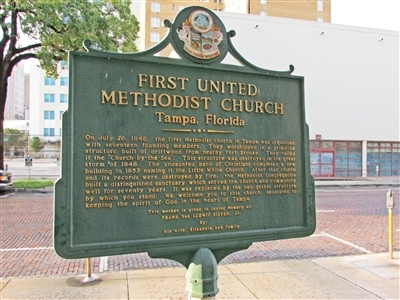 First UMC dates back to 1846, when it was established as the first Methodist church in Tampa. It was constructed of driftwood at Fort Brooke and was known as the Church-by-the-Sea. That primitive structure was destroyed by the “great storm” in 1848 and rebuilt, only to be destroyed later by fire, according to a historic marker outside the existing sanctuary, a neo-gothic design built in 1968. For generations, the downtown church tended to the spiritual needs of its members but by 2011, its membership had dwindled and its facilities were ailing. “The whole [Florida Annual] Conference made the decision to close it, which was difficult,” LaRosa said. When Florida Conference and South Central District leaders approached Hyde Park UMC about assuming the downtown church’s assets and liabilities, it led to an 18-month period of discernment before the decision was made to accept the offer, LaRosa said. 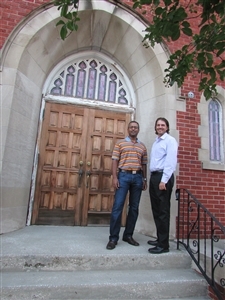 John Mathew, left, stands with Rev. Justin LaRosa at the front of the chapel that is finding new life as Hyde Park UMC's Downtown Initiative. Photo by B.C. Manion. Besides the sanctuary building, the campus includes a chapel, office and social hall. Hyde Park also holds the note on Vista 400, an affordable apartment tower for seniors formerly known as Methodist Place, which was sold to a private company a few years ago. Payments on the note produce an income stream for the downtown ministry. John Mathew, the lay leader for the Downtown Initiative, sees enormous potential. The exact shape the ministry will assume is not yet known. Added Mathew: “We’re still in our formative stage.” But the launch team has identified some specific benchmarks for the year. “One of the things we’re focused on this year is renovating the chapel and making it a usable place,” Mathew said. The next priority will be to make improvements to the sanctuary building and administrative building. How those facilities are used will depend on what the ministry learns as it creates small groups and identifies opportunities and needs. Possible uses include a café and a place for worship, small group meetings and community gatherings. 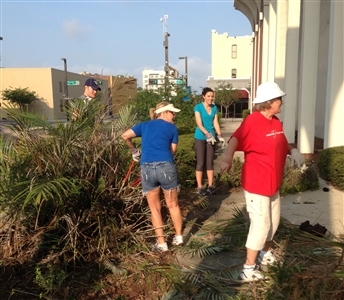 Volunteers from Hyde Park UMC clean up the landscaping around the new Downtown Initiative being launched in Tampa. Photo from Hyde Park UMC. The launch team is working on a business plan to create a sustainable ministry, Mathew said. The goal this year is to start five small groups. Over time, those small groups could form the foundation for a regular worship service downtown. LaRosa said weekly worship services won’t begin until there are 150 to 200 clamoring for that to happen. Other goals this year include naming the ministry and building community awareness of its presence. Meanwhile, the launch team plans to become more tuned into the downtown community. “We’ve got to figure out the entry points to connect with people,” LaRosa said. The idea is to engage people in issues that matter to them, he said. Mathew is thrilled to be involved. Learn to cultivate stillness and experience contemplative prayer at an introductory workshop led by Rev. Justin LaRosa, pastor of Hyde Park UMC’s Downtown Initiative. The workshop will be from 6:15 to 7:45 p.m. on Aug. 6 at the Hyde Park UMC’s Downtown Chapel, 1001 N. Florida Ave.
To learn more about the Downtown Initiative, visit www.hydeparkumc.org/ministries/downtown.